I am never without a quest to find the perfect 'obsession of the moment' - a shoe, a hat, a coat - as soon as I find and purchase it, I almost immediately realize there is something else I must have. 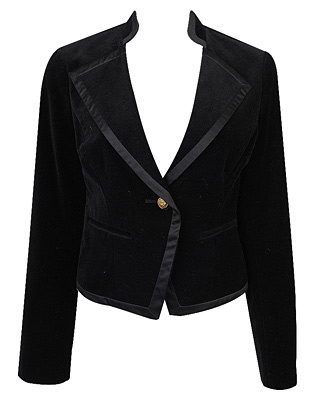 Right now, it is a black velvet blazer. Rich, dark, and soft. Something with versatility to go from day to evening. The J.Crew/Banana Republic/Victoria's Secret options are beautiful but at $118 (sale), $152, and $98 (sale) they are a bit more than I want to spend. 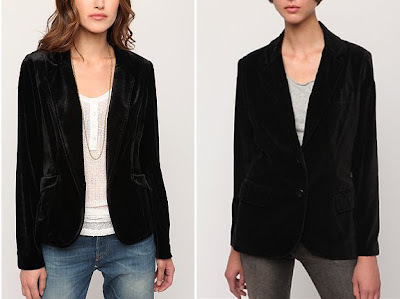 The Urban Outfitters Silence and Noise boyfriend blazer is a little better at $78, as is their Urban Renewal one at $58. Newport News has four velvet jackets, all $70 or less, and all of which have a weird detail that I hate: Patch Pockets, Satin Lapel, Charmeuse Accents, Bell Sleeves. Forever 21 has a jacket for $30, but I fear an F21 version will be lacking in quality than can not be overlooked on such a piece. $30 is my ideal price point, but I'd probably go higher if I really loved it. Clearly there is no shortage of black velvet blazers this season, but will I find one I love in both style and price? And anytime I think about wearing velvet, I think about George Costanza. Jump to the five minute mark and enjoy! I feel ya on the obsession of the moment mark- I'm getting to the point where it's a guilty admission! "So, I found something today..."
I've never been a huge velvet fan, but this season is eroding my resolve. Can't wait to see what you find! I've always agreed with George Castanza on that point - mmmm, velvet. I was googling a jacket and ran into you !